EMMY AWARD-WINNING JAZZ PIANIST/COMPOSER D.D. 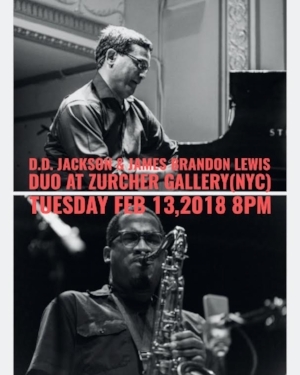 JACKSON TO PERFORM SPECIAL DUO CONCERT WITH SAX SENSATION JAMES BRANDON LEWIS AT ACCLAIMED ZURCHER GALLERY (NYC) ON FEB. 13TH, 2018 FOR ONE NIGHT ONLY. [Jan. 18/18, for immediate release]: On Tues., Feb. 13th at 8 pm, Emmy-winning jazz pianist/composer D.D. Jackson will be joined by critically-acclaimed tenor saxophonist/composer James Brandon Lewis for a special, one-night-only duo concert, featuring originals culled from both of their books, plus at-the-moment improvisations. The concert will take place at the Zürcher Gallery located at: 33 Bleecker St., New York, NY ($15 cover charge, with tickets available at the door only, and no additional food/drink minimum), an intimate art gallery space that has built an increasing reputation for it’s relaxed, inviting setting and the open-minded, no-holds-barred attitude of its performers. The concert will represent a continued return for Jackson to jazz performance and to the writing and premiering of original jazz compositions, following a detour the past several years as he delved more into the world of composing for television and film (culminating in his 4 Emmy nominations, and his first Emmy Award win as composer in 2016). After receiving his B.Music with High Distinction in Classical Piano from Indiana University, and his Masters in Jazz from the Manhattan School of Music, the Canadian-born, New York-based, Emmy-winning composer D.D. Jackson began his career as a jazz pianist/composer, and went on to record, perform, and tour around the world with some of the most acclaimed names in jazz, including: drummers Jack Dejohnette, Milford Graves, Andrew Cyrille, Billy Hart; saxophonists James Carter, David Murray, Hamiet Bluiett, Oliver Lake, Chico Freeman, Carlos Ward, Jane Bunnett, Chris Potter, and Dewey Redman; trumpeter Ahmed Abdullah; trombonists Craig Harris and Frank Lacy; violinist Billy Bang; flutist James Newton; poet Amiri Baraka; percussionists Kahil El'Zabar and Mino Cinelu; and many more. He also has collaborated frequently with Questlove and “The Roots”, most recently appearing with them on piano at the theater of Madison Square Garden for the John Lennon 75th Birthday Concert, at Radio City Music Hall (for which he also wrote 30-piece orchestral arrangements), and as an arranger/producer/pianist on their past 2 CD’s. Jackson has also recorded 12 jazz CD’s as leader or co-leader (including for Justin Time Records and for the major label BMG) featuring his original compositions, ranging from his Juno Award-winning solo piano CD “…so far”, to his larger-scale meditation on the events of 9/11 entitled “Suite for New York”; and two operas, including “Quebecite” [pronounced “KAY-beh-SEE-tay”] (based in part on his African-American father and Chinese mother), and “Trudeau: Long March/Shining Path” (about the father of Canada’s current leader, Justin Trudeau), both written with librettist George Elliott Clarke (the recently-appointed “Poet Laureate of Canada”). Jackson in recent years also began composing music for television, film and other media, and last year received his first Emmy Award for composition (for his writing on the PBS show “Peg + Cat”), among his 4 total Emmy nominations. He has also written regularly for both “The Wonder Pets” (Nickelodeon) (which won 4 consecutive Daytime Emmy Award for Outstanding Musical Direction and Composition), and several other shows, and has done numerous commissions, most recently for The Ahn Trio and The Metropolis Ensemble. As a writer, Jackson has also penned articles for such publications as the Village Voice and DownBeat magazine (for which he maintained a popular column on his experiences as a jazz musician entitled “Living Jazz”, for 5 years). Born In Buffalo, NY James Brandon Lewis began his pursuit of music at the age of 9 and would begin his music studies at the Buffalo Academy for the Visual And Performing Arts exposing him to Jazz Legends such as Dave Brubeck, Doc Severinsen, Local Legends Carol Mclaughlin, and Charlie Parker Alum the great pianist Al Tinney. James Brandon Lewis holds a Bachelors Degree from Howard University and a MFA from California Institute of the Arts . To date James Brandon Lewis has released 4 albums as a leader, 3 achieving critical acclaim. He has toured extensively worldwide with his own ensembles, as well as shared the stage, and recorded with amazing musicians such as William Parker, Hamid Drake, Cooper Moore, Jamaaladeen Tacuma, Rudy Royston, Gerald Cleaver, Charles Gayle, Dave Douglas, Richard Davis, Weather report Alum Alphonso Johnson, Ravi Coltrane, James Carter, Jimmy Heath, Joe Lovano and many others. Lewis is also the Co-Founder of Heroes Are Gang Leaders a collective of musicians and poets that keep a foot in the past,present, and future.